Photo of a person looking at the website of #SayNOto66d. Used with permission. 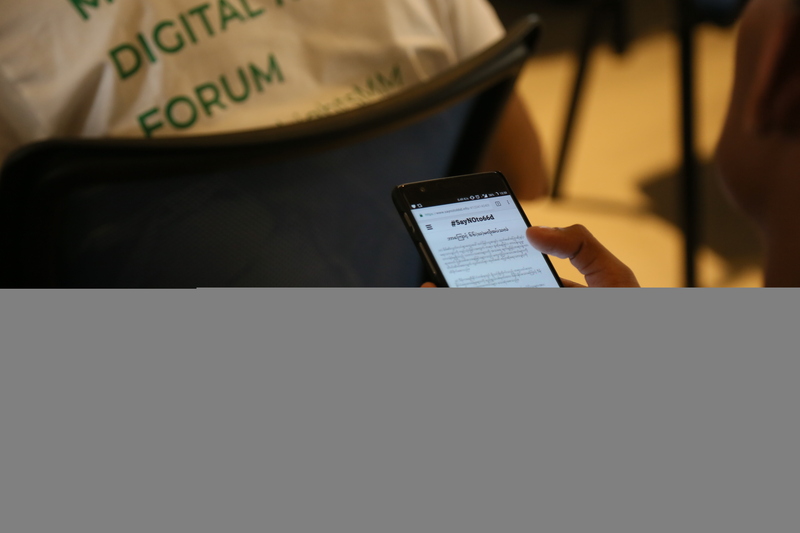 Several advocacy groups in Myanmar have launched a website containing information about online defamation cases in the past five years, as part of a campaign calling for the repeal of Article 66(d) of the Telecommunications Law which criminalises online defamation. The #SayNOto66d website was initiated and developed by local tech hub Phandeeyar. It was inspired by the work of the Movement for the Telecommunications Law Reform and Art.66D Abolishment, a coalition composed of 22 civil society organizations. It highlights a study by Free Expression Myanmar which monitored 66(d) cases between 2013 to 2017. In 2017 the government amended Article 66(d) which allowed respondents to post bail, reduced the prison term, and prohibited the filing of a case if the accuser is not directly involved in a defamation incident. But human rights groups insisted that these amendments failed to address the concern of many people about the draconian features of the law. The small changes made to the Telecommunications Law will not stop cases coming to court. Journalists, Facebook users and human rights defenders continue to face the risk of being prosecuted under 66(d) for vague reasons and at the behest of powerful individuals and institutions. In order to inform the public about the dangers of Article 66(d), the #SayNOto66d website uploaded all the essential information pertaining to the 106 defamation cases filed between 2013 to 2017. 1. The majority of cases under 66(d) are powerful people complaining about those who criticise them. 2. Defendants are always convicted and sentences are disproportionately harsh. 3. People with legitimate complaints, such as women who are facing gender-based violence online, are forced to use this inappropriate law because no other exists. The #SayNOto66d website also published several infographics showing that majority of the defamation cases were filed by members of the ruling National League for Democracy (NLD) which came to power in 2016. This disappointed many activists in and outside of Myanmar because NLD was part of the pro-democracy movement which challenged the junta for many years. Instead of reversing or repealing repressive laws by the junta, the NLD-led government allowed military officials, politicians, and other powerful individuals to use laws like 66(d) to harass and prosecute their critics. Another infographic also showed that the majority of complainants are linked to the state. Aside from providing the public with information about the 66(d) cases, the website also advocates the repeal of the law by encouraging visitors to sign an online petition, lobby the parliament, and report 66(d) cases which are not yet part of the database. The aim of the website is to provide fact-based advocacy to inform everyone about 66(d) especially the total number of cases and highlight how the cases filed to the people were closely related to the criticism of the state. Journalists and researchers will be able to use the data available on the website to contribute and make the movement stronger. Various groups are pushing for the decriminalization of defamation and the adoption of a law on gender-based violence. Meanwhile, the United Nations Human Rights Council has already called attention to the Myanmar government about the role of 66(d) in undermining free speech in the country.